Mastitis is essentially an infection of the breast tissue. The term is widely used to cover a range of related conditions, all of which involve inflammation and/or pain in the breast tissue. Mastitis is most commonly associated with breastfeeding When this is the case, it is termed ‘lactation or puerperal mastitis’. So bear in mind, if you have an inflamed painful breast (or breasts), whilst breastfeeding than mastitis is the most likely cause. Note: ‘Peurperal’ literally means ‘relating to the period of time following childbirth’. In contrast, when the condition occurs in non-lactating women it is often termed ‘non-puerperal’ mastitis. The most common cause of mastitis is an over-supply of breast milk. However, this condition can also be caused by blocked breast ducts due to other reasons. Wow! That looks and sounds really painful. Yes, but this condition is easy to treat and nothing to worry about at all. Do not worry, the symptoms listed above are most likely to be associated with mastitis and nothing more serious. However, there is a rare, but very aggressive type of cancer called inflammatory breast cancer that has very similar symptoms. 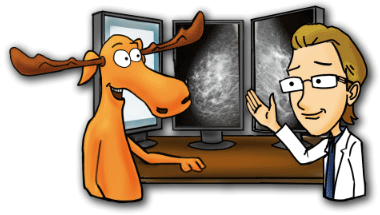 Due to the similarities between mastitis and inflammatory breast cancer, it is important to closely monitor symptoms. If the symptoms of mastitis are not resolved within five weeks, a full medical investigation to rule out breast cancer should be initiated. Oh no Doc! Not the ‘C’ word again. Sorry Moose, but it is important to be aware of the similarity in symptoms between the two conditions. Yes, I can see from the photos of the two conditions. Does Mastitis increase the risk of Breast Cancer? Lactating mastitis is an infection and completely unrelated to breast cancer. Furthermore, having this condition whilst breastfeeding does not increase your risk of breast cancer. However, there is some evidence that non-puerperal mastitis (not related to childbirth and breastfeeding) may increase the risk of inflammatory breast cancer. A small, 2002 medical study examined 277 women with non-puerperal breast inflammation within a year of diagnosis. The study found that women with a diagnosis of non-puerperal mastitis had a 37-fold increased risk of breast cancer within 12 months of treatment. Although the reasons for this are unknown, the study concludes that although mastitis is not an established risk factor for breast cancer, breast cancer screening should be more frequent in these cases. Possibly, one explanation for the above study is that inflammatory breast cancer may be misdiagnosed as mastitis. Oh, that is why frequent screening and observation after a non-puerperal mastitis diagnosis is important … just in case. Importantly, ‘mastitis’ is, in fact, a general term for a breast infection. However, there are a variety of other terms that are associated with the presence of inflammation, discharge and tissue damage of the breast. Idiopathic granulomatous lobular mastitis (IGLM) is an uncommon chronic inflammatory breast disease. IGLM often forms a palpable breast mass that can mimic invasive breast cancer, both on a mammogram and clinical examination. It is important to note that IGLM is a benign condition. Indeed IGLM is a breast disease that often occurs in younger women following the birth of a child. However, IGLM has not been shown to be consistently related to either breastfeeding or the use of oral contraceptives. Okay, What can you do to ease the symptoms? As mentioned earlier, simple mastitis is often treated with antibiotics. Symptoms should begin to improve within 48 hours and certainly over 5 days. If any symptoms persist it is VERY important to see your physician as soon as possible. Because mastitis related to breastfeeding is caused by an excess of milk blocking the ducts regularly expressing milk and breastfeeding the baby will help. Get a good night sleep? With a baby, really? I know, I know, but resting when the baby sleeps is good. How can I prevent mastitis if I am breastfeeding? The best way to prevent this condition is to get plenty of rest and also to eat a healthy, balanced diet whilst you are nursing. Also, avoid your breasts becoming overly full with milk. If your breasts are not empty after nursing or expressing milk, or you have a plugged duct, I recommend you use warm compresses and massage to get the milk out. tie a little ribbon to your nursing bra strap and alternate it to remind you. Or you could use a bracelet. Is it safe to continue breastfeeding with mastitis? You can safely continue breastfeeding your baby or express breast milk to feed your baby during illness and treatment. Your little one is the most efficient pump you have for emptying your breasts. In addition, your breast milk is still safe for your baby to drink. This is because any bacteria in your milk will be destroyed by the baby’s digestive juices. By the way, congratulations on your new baby and doing something fun again in 18 years! Back to miscellaneous breast lesions list or our brand new homepage or try our posts on Incidence and Mortality Rates.